Costs and the absence of compelling incentives to invest in health information technology contribute to the sluggish adoption of its meaningful use in geriatrics areas. As in most healthcare sectors, the adoption of health information technology (HIT) among geriatric care providers is low. It’s a reality that public and private agencies—and providers themselves—hope to change with the promise of incentive funds under the Health Information Technology for Economic and Clinical Health (HITECH) Act. Sluggish adoption among geriatric care providers can be traced to many of the same obstacles faced by other provider types. Among the most common are costs and, until now, a lack of any real incentives to invest limited resources into HIT. 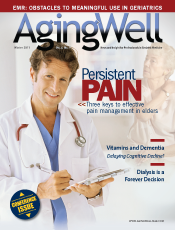 However, geriatric care providers also faced several unique challenges. One of the most significant is the lack of commercial options that meet the needs of geriatric care, which is typically provided in multiple settings and by multiple provider types—all of whom would benefit from real-time access to comprehensive patient information. Phillips, whose organization’s On Lok Lifeways program provides all-inclusive primary, preventive, and long-term care and social services to enable frail elders to live at home, also notes that most commercial EMR offerings simply do not provide the features necessary to drive optimal care. For example, while tools designed to assess and manage chronic conditions are useful, they don’t distinguish between the needs of younger patients vs. their older counterparts. Because geriatric care is provided in so many settings, many are optimistic that the incentive funds available under HITECH will accelerate adoption within the sector. In a nutshell, there are two programs under which eligible providers can secure incentive payments for the meaningful use of HIT, one for Medicare and one for Medicaid providers. Every eligible provider who is a “meaningful user” of an EMR, as defined by the stage 1 criteria issued by the Centers for Medicare & Medicaid Services (CMS) (see sidebar), can receive up to $44,000 from Medicare or $65,000 from Medicaid. Eligible providers must decide whether to receive Medicare or Medicaid incentives, but not both. Hospitals, however, will be eligible for both. Providers who do not adopt an EHR until 2013 will receive lower incentive payments and after 2015, the CMS will begin to penalize physicians who do not have compliant EHR systems by decreasing reimbursements. One criticism expressed by many in the geriatric field is the lack of inclusion of their sector in the discussions about eligibility and structure. As a result, key sectors have been excluded. Indeed, many in the geriatric care community are confident that HITECH will be the catalyst that drives HIT past the “wish” stage by encouraging broader adoption and use. This, in turn, will deliver the outcomes necessary to convince fence-sitters that HIT can facilitate the information collection and sharing necessary to positively impact care and improve efficiency and productivity. For example, in the hospital setting, achieving meaningful HIT use will be particularly beneficial to the elder population. This is especially true of criteria mandating the use of e-prescribing, quality measures, and electronic information exchange. Achieving these capabilities means that “when a patient comes to the hospital, their information will already be populated. It will decrease the patient from having to remember the medications they are on, dosages, etc. It can also [send] reminders to patients when they need preventive care tests,” says Emma Brandon, director of clinical information systems for Camden, N.J.-based Cooper University Hospital. Brandon suggests older patients will benefit more than others from HIT, as they tend to use medical services more often. “It will decrease repeating the same information at every visit. It will trend tests over a period of time. It will also decrease the amount of redundant, unnecessary tests,” she says. Indeed, that ability to share patient information was cited most often as the primary overarching benefit meaningful use will have on geriatric care. By enabling providers and caregivers across the spectrum to access the most recent and comprehensive information, HIT will drive improved care coordination and subsequently, improved care outcomes. “The two [criteria] that really popped out for me were interoperability, which will then allow all different venues of care to communicate, and also e-prescribing with medication reconciliation,” says John Tempesco, FACHE, chief marketing officer for the Informatics Corporation of America (ICA), which takes technology developed by Vanderbilt Medical Center to the broader healthcare market, including a comprehensive health information exchange solution. He notes that the most common form of medication reconciliation today occurs when a patient or caregiver brings in a bag of medications for evaluation. More often than not, providers will find old prescriptions that were never halted when new ones were written or prescriptions with serious contraindications that were never identified because they were written by multiple prescribers who had no way of knowing what other medications an individual was taking and why. Widespread information exchange will also benefit older adults who relocate, leaving behind the network of providers who cared for them during the majority of their adult lives. When these individuals become medically dependent, collecting an accurate health history and establishing a comprehensive current view of the patient is nearly impossible. Thompson points to the regional extension centers as a particularly valuable component of the HITECH Act for their ability to accelerate development of the broadband infrastructure necessary to ensure patient data can be exchanged across and between all providers regardless of geographic location. “The most important development [from HITECH] will be the ability to share appropriate patient data across care settings. Home care nurses could share data directly with physicians and then, on physicians’ orders, share this directly with other physicians or hospitals and emergency departments,” he says. For Phillips, the most exciting aspect of broader information sharing is the ability to move toward a more holistic approach to caring for the frailest patients. These individuals require a multifaceted care team that can best meet their needs when they have immediate access to any health status changes. Expectations may be high in terms of the impact HITECH incentives may have on the adoption and meaningful use of HIT in geriatric care, but so is skepticism. Even those who recognize its value are skeptical that the incentive program, as currently structured, is capable of achieving its goals in the geriatric care sector. For starters, existing HIT use in the sector is fragmented. Functionality, capabilities, and overall usage vary widely from one provider type to another—something the framers of HITECH failed to take into consideration. Rod Baird, president of Geriatric Practice Management, Inc, an Asheville, N.C.-based firm that provides comprehensive physician management services to long-term care practices, is far more blunt. He believes providers who seek out HIT solely to achieve meaningful use under the current rules will wind up with systems that are ill-equipped to meet their needs. “We have the HITECH Act because … a lot of people for very good reasons were saying we need to have a way of seamlessly exchanging patient information across providers. Lack of ability to do that causes a great deal of delay in decision making and a lot of money. That’s a great idea. But they just took that idea and said it will work everywhere. They then imposed this standard on a world where it works in half, but in the other half it doesn’t,” says Baird. He adds that the problem stems from the exclusion of the geriatric sector from much of the dialogue that led to development of the meaningful use criteria. As a result, policy makers failed to take into consideration the reality that geriatric providers are rarely able to document patient histories in black-and-white, standardized detail. Another danger of attempting to force a structured approach on the geriatric care community is that it may result in physicians making decisions that, while in line with general best practices, run counter to best practices for geriatric patients. Baird points to the Beers Criteria, a national guideline and reference guide designed to improve the use of medications for elders that is incorporated into most e-prescribing software. These criteria prompt systems to generate an alert or warning if a physician attempts to prescribe a drug that is contraindicated. For example, Beers flags benzodiazepines as drugs that should not be prescribed because of their dangerous side effects. However, many physicians prefer the use of these drugs to manual restraints for elder nursing home patients suffering from dementia whose behavior becomes unsafe. “If you’re in a niche world where best practices are contradictory to what the ‘techno-weenie’ programmers say, you’re going to get called to the carpet. That is the real outcome,” says Baird. “We’ll make all kinds of things go wrong clinically; more people will be going to the hospital because physicians won’t take the liability for being the bad actor. Despite his skepticism, Baird remains confident that the CMS will tweak and clarify the existing meaningful use rules to eliminate the contradictions and make it possible for niche providers to benefit from HIT and HITECH. Until then, he recommends that those who can wait to implement new systems do so. For example, those who are eligible for both the Medicaid and Medicare programs can wait until 2015. Medicaid-only providers can wait until 2016, while Medicare-only providers can wait until 2015. Meanwhile, Baird’s company will continue developing interfaces and other modifications for existing systems that will enable member physicians to reap the benefits of HIT. In doing so, they will also be better positioned to achieve meaningful use once standards have been adjusted appropriately. — Elizabeth S. Roop is a Tampa, Fla.-based freelance writer specializing in healthcare and health information technology. The definition of an eligible provider (EP) differs based on the specific incentive program, though in the case of both Medicare and Medicaid, it is based on individual providers. Therefore, each EP within a multiprovider practice may qualify for one incentive payment per year as long as he or she demonstrates meaningful use. Under the Medicare program, an EP is defined as a doctor of medicine or osteopathy, doctor of dental surgery or dental medicine, doctor of podiatry, doctor of optometry, or chiropractor who is not hospital-based. A Medicaid EP is defined as a physician, nurse practitioner, certified nurse midwife, dentist, or physician assistant; is not hospital-based; and has a minimum 30% Medicaid patient volume (20% for pediatricians) or practices predominantly in a federally qualified health center or rural health center and has a minimum 30% patient volume attributable to needy individuals. Hospitals eligible for Medicare payments are paid under the hospital inpatient prospective payment system and must be located in one of the 50 states or the District of Columbia. For Medicaid, eligible hospitals are acute care facilities with at least 10% Medicaid patient volume or children’s hospitals. Enter at least one medication order via computerized physician order entry for more than 30% of unique patients with at least one medication in their medication list. Enable drug-drug, drug-allergy, and drug-formulary checks and provide access to at least one internal or external drug formulary. More than 80% of all unique patients should have at least one entry or an indication that no problems are known for the patient recorded as structured data in a problem list. Electronically transmit more than 40% of all permissible prescriptions written by an EP. More than 80% of all unique patients should have at least one entry recorded as structured data into active medication and medication allergy lists. Record as structured data demographics, vitals, and smoking status for more than 50% of all unique patients. Implement one clinical decision-support rule. Provide more than 50% of all patients who request one with an electronic copy of their health information within three business days. Provide more than 50% of all patients discharged from an eligible hospital inpatient or emergency department with an electronic copy of their discharge instructions upon request. Provide clinical summaries to patients for more than 50% of all office visits within three business days. Have an indication of advance directive status recorded for more than 50% of all unique patients aged 65 or older who are admitted to an inpatient department. Incorporate as structured data more than 40% of all clinical lab test results ordered by the EP or authorized provider of the eligible hospital for patients admitted to its inpatient or emergency department. Generate at least one report listing patients with a specific condition. Send appropriate reminders to more than 20% of all unique patients aged 65 or older or 5 years old or younger. Perform medication reconciliation for more than 50% of transitions of care. Provide an electronic summary of care record for more than 50% of care transitions and referrals. A comprehensive criteria list and other program information can be found at the EHR Incentive Program section of the CMS website at www.cms.gov/EHRIncentivePrograms. Because older adults use services more frequently, they are more likely than others to benefit from health information technology (HIT). HIT usage in geriatrics lags well behind that of other practice areas. The implementation and adoption of HIT has been shown to reduce medical errors and increase resident and patient safety. Every eligible provider who is a meaningful user of an electronic medical record, as defined by the stage 1 criteria issued by the Centers for Medicare & Medicaid Services, can receive up to $44,000 from Medicare or $65,000 from Medicaid. Interoperability will allow different care venues to communicate and link e-prescribing with medication reconciliation.